Holding the conference in a remote location turned out to be a good idea however. From 40 to 70 persons come to the conference every year, and 20 to 30 presentations are made. Regular participants include people from the Moscow and St. Petersburg university, the Zoological institute of the Russian Academy of Sciences, the P.P. Shirshov Institute of Oceanology, the A.N. Severtsov Institute of Problems of Ecology and Evolution, the A.I. Gertzen Pedagogical University, and the WWF of Russia. Regional organizations also made their presentations. These were the Geological institute of the Kola Science Center of the Russian Academy of Sciences, Northern Scientific Research Institute of Fisheries of the Petrozavodsk State University, the Institute of Language, Literature, and History of Karelia, the M.V. Lomonosov Northern (Arctic) Federal University, the Vyg Fish Breeding Enterprise, the Matvey Korguyev Museum in Chupa, the Archangelsk School of Ship Boys, and the Kola Center for the Protection of Wild Nature. Colleagues from other countries have also participated in the conference. These where from the Free University of Amsterdam (Holland), Padua University (Italy), Floating Marine Research Center, and the Lighthouse Foundation fund. In the last three years so many various reports have been presented at the conference that it is not possible to consider them here in any detail. 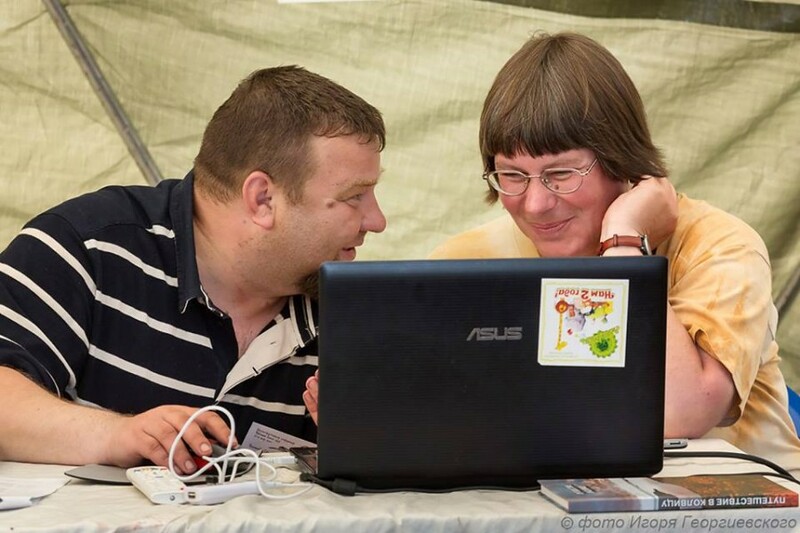 Stories of fish and birds, seas and rivers, plants and mountains, people and communities, scientific expeditions and educational programs for children, crafts and tourists, about the past, present, and future – all these various presentations were united by only one theme, the White Sea. Someone looking at the event from afar may think it silly to bring all these reports to under one roof. 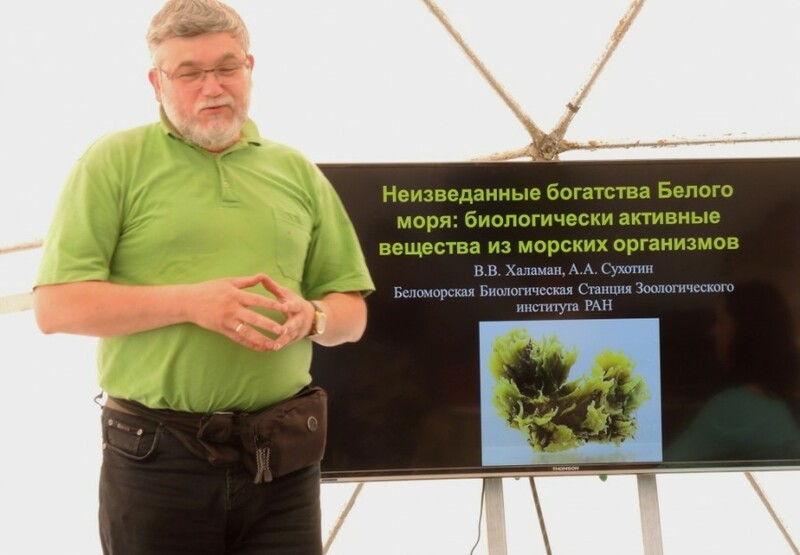 The author of the report on the algae lab in the Solovki (Algal Research in the Solovki Camp/Special Purpose Prison in 1934-1937 by O.V. Maximova)cannot possibly be interested in earthquake research (New Date on Post-glaciation Seismic Dislocations in the North Karelia by A.V. Marakhanov, F.A. Romanenko, and E.V. Lipilov); someone seeking information on an undeservingly forgotten artist and popularizer (Evgeny Fedorovich Bartold, an Artist and an Organizer of Tourism in the Kola North and Karelia by V.A. Likhachev)has no interest in meromictic lakes (How Sea Bays Turn into Freshwater Lakes by E.D. Krasnova), while a professional ornithologist (Cultural Landscapes and Biological Diversity of Passerines in the North White Sea Region by I.N. Panov) would seem to be profoundly indifferent to the types of old headstones (The Cemetery in Gridina as a Revealing Monument of Pomorye Spiritual Culture by A.P. Konkka). However, most of the participants pointed to the multi-disciplinary nature of the conference as one of its main attractive points. The multidisciplinary approach widens the scope of issues accessible to researchers, and allows them to see (and often to correct) their work in context of the scientific process on the White Sea on the whole, and to make new contacts. Because, regardless of the specific subject of the report, they all are about the territory well familiar to all the participants, considering specific issues opens the possibility of a totally new outlook at seemingly familiar phenomena. The conference attracts people who are sincerely involved in their work and love the place where they do it. Regardless of the subject of any specific report, it was about the White Sea, with which all those attending are in love with, and for whom everything happening in the region is important. And this love is not theoretical/platonic but practical. Much of the feedback emphasize that the participation of field workers, who directly observe important processes in the course of their expeditions, make the conference particularly attractive. Youri Rybakov and Alexandra Goryashko. Photo by Igor Georgievsky. Olga Yagodina, Alexey Tolsikov, and Julia Suprunenko. Photo by Igor Georgievsky. Geological tours around Chupa, held every year as part of the conference and led by geologist N.I. Frishman, contribute to creating the attractive atmosphere of the event. At the geological tour with N. Frishman, 2016. Photo by Alexandra Goryashko. A wonderful addition is participation of creative people in love with the White Sea. 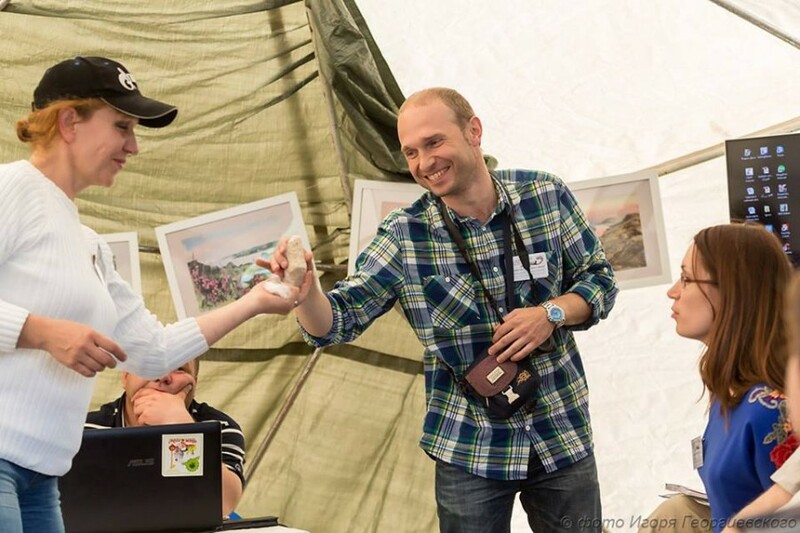 In 2015 part of the event was a show of paintings and a workshop by artist Anna Mikhaylova, Alina Lesova, and Gennady Pravdin. An art exhibition at the 2015 conference. Photo by Irog Georgievsky. To end the story about the conference “Natural and Cultural Inheritance of the White Sea” one may recall its predecessors: scientific conferences held at the White Sea Biological Station of the Moscow State University from 1996 to 2008. These were held in the summer and scientists, graduate students, and students of a variety of science institutions working on the White Sea came to these. The scope of their interests was very wide, and the atmosphere non-formal and friendly. 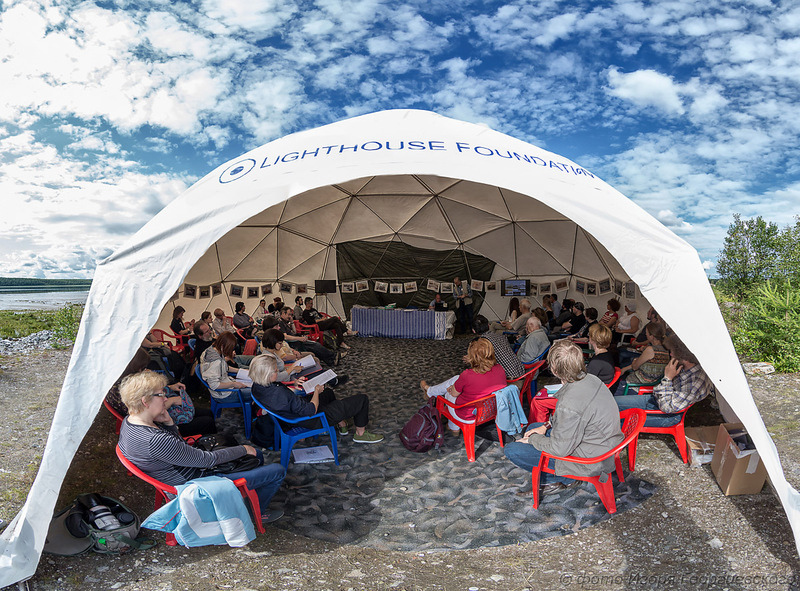 Participants of these conferences – and their number in recent years reached 150 persons – not only got used to meeting on the White Sea in the summer. Such meetings became an integral part of the process of making science. 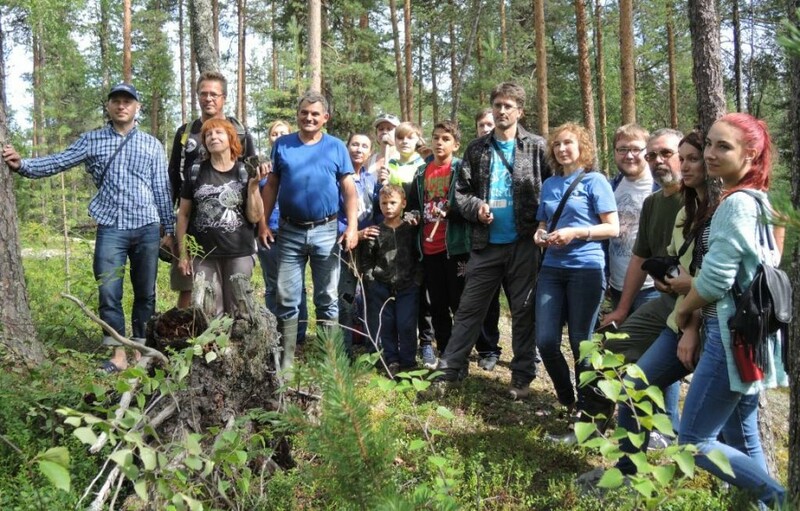 From 2008, when the Biological Station could no longer host conferences, a noticeable gap has formed in the White Sea science community. The Chupa conference managed to fill the gap. It is now held in a different place, organized and named differently but the main thing got preserved: “All the participants care and sincere. It is a rare thing these days, and is thus to be treasured”. Finally, a note from me: Anyone interested in visiting this conference in July 2017 is invited to contact me at manfriday@yandex.ru, and I will assist with transportation, translation, and logistics generally.